Combine all pesto ingredients except for the olive oil (affiliate link) in a food processor or blender. Blend until mixed and smooth. With the motor running, add olive oil (affiliate link) in a slow stream until combined. 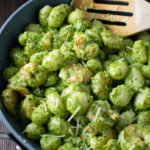 Pesto should not be too soupy or fine. Set aside. Heat 1 tablespoon of olive oil in a large nonstick pan on medium heat. Cook the shrimp until fully cooked through and no longer translucent, about 3-4 minutes per side. Season with salt and pepper. Meanwhile, bring a medium pot of water to a boil. Add a pinch of salt and add in gnocchi. Boil for about 2 minutes or until gnocchi starts to float to the top. Strain well and transfer to the pan with the shrimp. Turn the heat to low and add in the pesto sauce and cream, stirring until fully green and coated in pesto sauce. Let sit on low heat for 2-3 minutes and serve immediately with extra Parmesan cheese on top if desired. You can easily substitute shrimp for sauteed chicken if you prefer, or leave the protein out altogether.